SLEAZYMADRID is the main Spanish gathering of international fetish men which takes place in the country´s capital. A combination of bars, clubs, discos, shops, saunas and hostels are part of the project, organizing parties and fetish-themed activities.Top international Djs and producers consolidate the event. Sleazy Madrid is held several times a year. With Willem Alexander and Maxima becoming King and Queen of Holland in 2013, the traditional Dutch national holiday Queensday, has become King's Day (Koningsdag in Dutch). 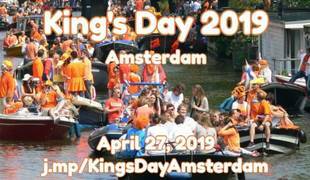 It will be celebrated on the King's birthday, the 27th of April Kingsday is celebrated in the whole of The Netherlands. In Amsterdam almost the whole city centre is a free market, people selling old things on the street, or home baked caked, music performances etc. At several squares and streets there are big outside parties. Vallarta Pride is an event that promotes Puerto Vallarta as an international LGBT destination, with our own funds. Volunteers and professionals dedicate hundreds of hours throughout the year, to carry out this great event, which manages to bring more than 14,000 LGBT friendly tourists to our destination only during Vallarta Pride. We do not receive government help and with a lot of effort, we work all year to celebrate with you and represent LGBT rights in Puerto Vallarta and Mexico, but we need your help! Whether you are an entrepreneur, hotel owner, condo owner or a friend of the LGBT community, we invite you to be part of this great goal that is to defend and make our rights known, as well as show the world that Puerto Vallarta is one of the best destinations LGBT in the world. Paris Fetish est un rendez-vous annuel à destination de la communauté fétichiste française et internationale. The biggest gay fetish event in France ! Sizzle Miami is America's biggest urban gay event. With various events and parties at the biggest clubs of Miami. In 2019, NYC Pride welcomes WorldPride as we mark the 50th Anniversary of the Stonewall Uprising and a half-century of LGBTQIA+ liberation. 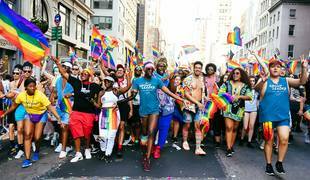 Commemorating the 50th anniversary of the Stonewall Uprising, NYC Pride will simultaneously host WorldPride during its 2019 season. The sixth edition of WorldPride will welcome millions of domestic and international LGTBQI+ guests to New York City. Attendees will encounter a once-in-a-lifetime experience to honor and celebrate the Pride movement in the same location where the modern movement began in 1969. We all celebrate Pride in different ways, which is why you'll find over 50 different official and partner events offered during WorldPride NYC / Stonewall50. The massive Pride March will be held on Sunday 30 June 2019. Celebrate PRIDE on a tropical island that is legendary for its laid-back style and its open and accepting atmosphere. Whether you’re looking to party with friends, travel with family, or get lost in the magic of our tropical island, rediscover Key West and discover how one island’s One Human Family philosophy has created one of the most integrated and unique communities in the world. Show us your pride, we will show you our Key West Pride! Join us for Key West Pride and enjoy dance parties, drag shows, bike tours, water excursions, a street fair, and even a parade through town. Our Miss Pride, Mr Pride and Ms Pride competitions are infamous for their fun and their skin. Make your plans now to attend Key West Pride. Most events are All Welcome. All events are uniquely Key West. Thousands of gay pride festival attendees are expected in the heart of West Hollywood (LA) to revel amongst world-class headlining entertainment (previously featured artists include: Olivia Newton John, Joss Stone, Joan Jett and the premiere of the music video “Hollywood” by Madonna). In addition to lively dance pavilions with music spun by some of the hottest DJ’s in the country, a new layout of festival grounds boasts food, drink, socialization, community programming and unique exhibitors, all hosting a diverse spectrum of activities to entice the entire LGBT family. The parade of Roma pride will go from Piazzale Ostiense to Piazza San Giovanni.